We currently have three dogs of our own, all rehomed, and all lovely! Billy, an Irish Wolfhound x Collie is our eldest. 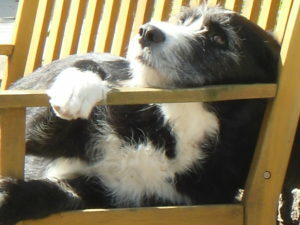 He came to as a foster dog from Merlin Animal Rescue as a 12 week old puppy, he is now 8 and head of the household. Billy – get up and do something useful! 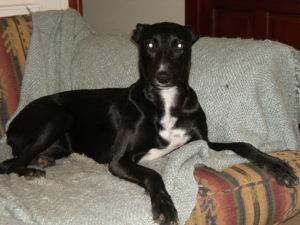 Coco, a Lurcher cross also came to us as a foster dog from Merlin Animal Rescue as a two year old. 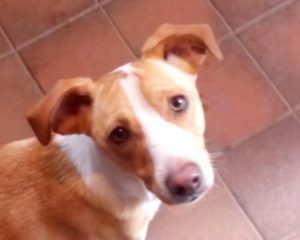 When she first arrived she suffered from separation anxiety and still exhibits some if she’s left in the house with other dogs. Interestingly we’ve since found that she loves the outdoor kennel and is quite happy in there as she can watch the chicken, cockerel and the geese. After losing my old boy Floyd (a rescue dog from RSPCA Bryn y Maen in Colwyn Bay) I was looking for another little feisty dog and along came Scooby! I heard about Scooby when told that some puppies were in desperate need of a good home. Discovering he was a Jack Russell cross I thought he’d be a fighter but the Rescue Centre gave him the perfect name, he’s a scaredy-cat and definitely a lover not a fighter! 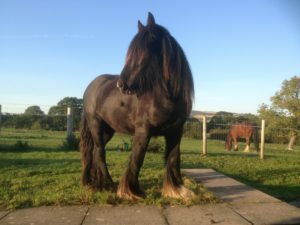 Zack – is a Clydesdale x Gypsy Cob, standing at 15hh with a leg in each corner, he’s now 20 and I brought him when he was 9yrs old and a riding horse. Zack – the best workhorse there is! 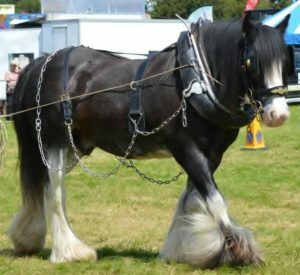 Within a year of having him we started his training and he is now an all singing all dancing working horse from driving exercise carts, to old farm drays. When it comes to logging and ploughing he’s ‘the man’. 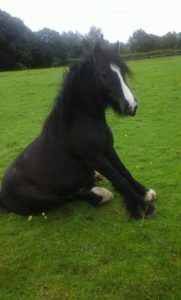 Taffy – my baby pure Shire stands at 18.2hh and thinks he’s a dog. He’s nine and I took him on when he was 6 months old and was very poorly horse indeed. 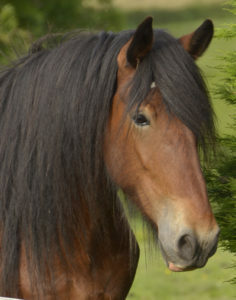 Yogi a 5 year old Shire from Ireland came to us as a colt at 2 yrs old and was so laid back. In 2015 we were providing logging demonstrations with Yogi but unfortunately in 2016 he had to undergo an operation on this hock and since then he has been out of action. 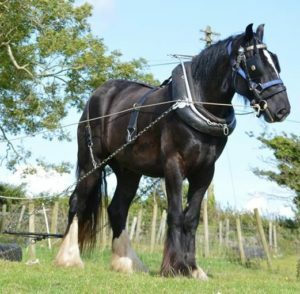 We’re hopeful he’ll be working again soon though and you’ll be able to see him working in the fields again or at one of the many logging demonstrations we give at various local agricultural fairs. Booboo, a 4 year old cross Gypsy Cob, was scared of his own shadow and people. Now however he is coming along nicely and should be logging by the summer months. Living alongside my horses is ‘Rav’ a two year old Cob who belongs to my best friend’s son Flyn, he’s the cheeky monkey in the pack but he’s learning fast. 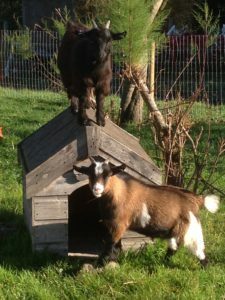 Stand & Ollie are my pygpy goats, cheeky and friendly they’ll come and eat out of our had and try and sit on your laps. 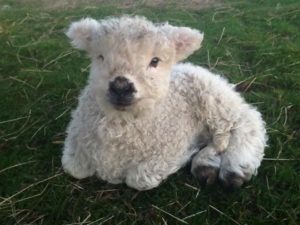 Living with them is pinky & perky two of our last years lambs who’s mother undortunatly died. 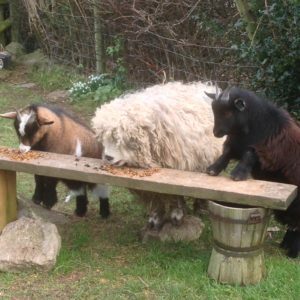 I have 6 sheep, all Grey-faced Dartmoors; Geraldine and her babies Tom & Jerry, Alice with her little girl Minnie, and Molly who is Pinky & Perky’s half sister. 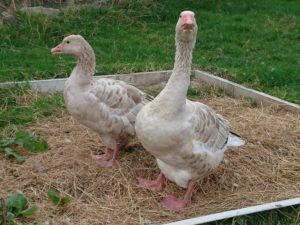 Our Brecon Buff geese, Mr & Mrs Llelwyn are Welsh through and through and keep me in order! He’s just the perfect gentleman, so sweet and lovely towards Mrs Llelywn, and we are hoping to have babies from them this year, so fingers crossed! 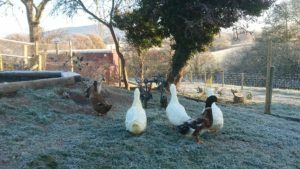 We also have a number of ducks and chickens. The big cockerel was named ‘Car Wash’ by my eldest granddaughter we have no idea why but its stuck. Our young cockerel is called ‘Mr John Thomas’ I’m sure you can guess why! As for the chickens the three youngest; Beccy, Tara, & Ruby were named by my friend’s children and the others after meals from McDonalds – but I mostly just call them ‘chuck’. 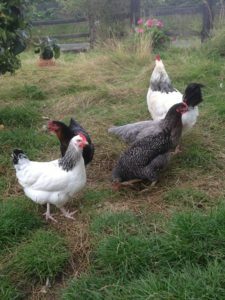 They all provide beautiful free range eggs some of which will be provided to you, perhaps for a lazy breakfast, during your stay. The ducks were all named after the famous seven dwarves of Snow White fame. 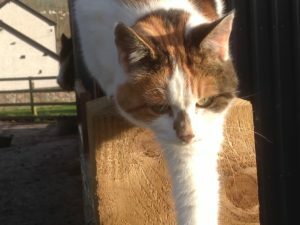 And lastly the farm cats, Tink and Scamp. Tink came to us from a friend how could no longer look after him, and Scamp came from the Cat Rescue Centre. They live in the barns and stay well away from our dogs so are not likely to bother yours either!